By Susan and Mike McFarlane, RobotGuide. Edited by Frank Tobe, The Robot Report. Created in 2010, Technopark “Skolkovo” provides innovative companies participating in the project to support the development of technology assets, and contribute to Russia’s establishment global innovation markets. Finnish Prime Minister Katainen suggested that hyper-connectedness allowed Microsoft to become the symbol of Finnish innovation: Microsoft understood that it was investing an important sector when it bought Finland’s Nokia. The three nations supported innovative development within their countries and see the importance of working with strategic partners — including other nation states and businesses — in order to support best practices in innovative development and, likewise, their growing economies. Sustainable economic development is often at the mercy of politics, election cycles and alterations in federal investment, all of which effect how dreams can be realised. Those in the room all seemed committed to finding the will to sustain world-beating innovation utilizing their information technology advantage and large talent pool of well-educated young people. 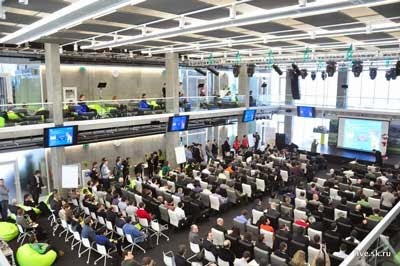 The 2014 Skolkovo Robotics Conference takes on a special importance in the pursuit of those goals. The 2-day agenda includes an expo of robotics pilot projects, as well as talks and round-table discussions by notable international guests and partners. “The venture market in 2012 was $46bn in the US and $1bn in Russia with growth by 2020 to $75bn in the US and $5.5bn in Russia,” said Mikhail Shekhovstov from J’son & Partners Research. The main funding methods available to innovative companies in Russia today include venture capital, business angels and seed accelerators. Although crowd funding and crowd investment was discussed at the 2013 conference, it is not really present yet in the Russian investment market. Business angels are only just starting to become a part of the funding toolbox in Russia. The importance of inspirational Russian investors such as Yuri Milner, Dmitry Grishin and Dmitry Itskov, and the global investment community is not ignored, but all recognise that they are few and far between.